Twin Cities Greenways » What is a Greenway? The word “greenway” has been used by a lot of people to describe a lot of different things. Our concept of Greenways is centered around a trail for non-motorized users, primarily serving bicyclists and pedestrians. Our proposed design is focused on providing safe and efficient transportation as well as excellent places for recreation. 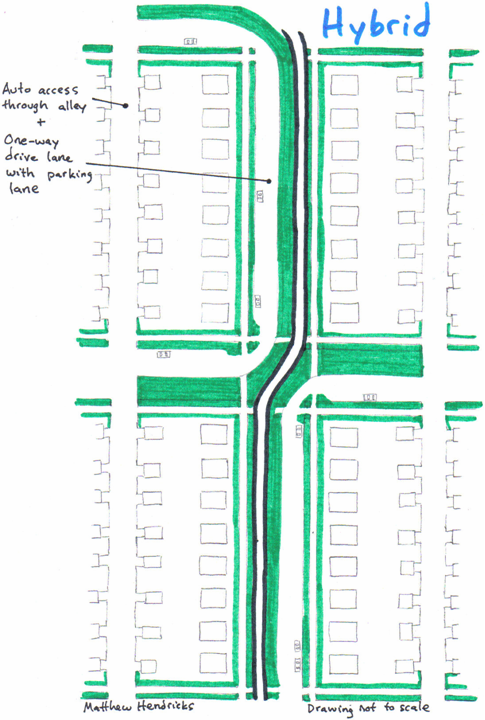 Fast – Greenways are fast because intersections are limited – i.e. people using the Greenway do not have to make frequent stops for traffic. Safe – By reducing the number of intersections, safety is enhanced. Safety also requires good sight lines, appropriate lighting, and adequate path widths for bikes and pedestrians. Pleasant – Greenways are physically separated from motorized traffic, making them fundamentally pleasant places to walk or bike. Gardens, adjacent parks, and landscaping add to the enjoyment of being on a Greenway. Greenways function as linear parks, attracting a wide variety of visitors. While the majority of Midtown Greenway users are bicyclists, it also draws walkers, runners, wheelchair users, and rollerbladers. In addition to the space shared by cyclists and rollerbladers, a dedicated lane for pedestrians and other slower traffic is vital to creating a well-rounded system. The Midtown Greenway accomplishes all of these goals, because it is located on an old railway line that passes under (or over) most city streets. Thus, intersections with cars and trucks are few and far between, making the Midtown Greenway the fastest and most pleasant way to traverse Minneapolis. For this reason, the Midtown Greenway is among the most popular parks in the Twin Cities, and is one of the busiest bike trails in the country. This success has spurred several questions: How can the reach of the Midtown Greenway be extended? Where we build the next Greenways? 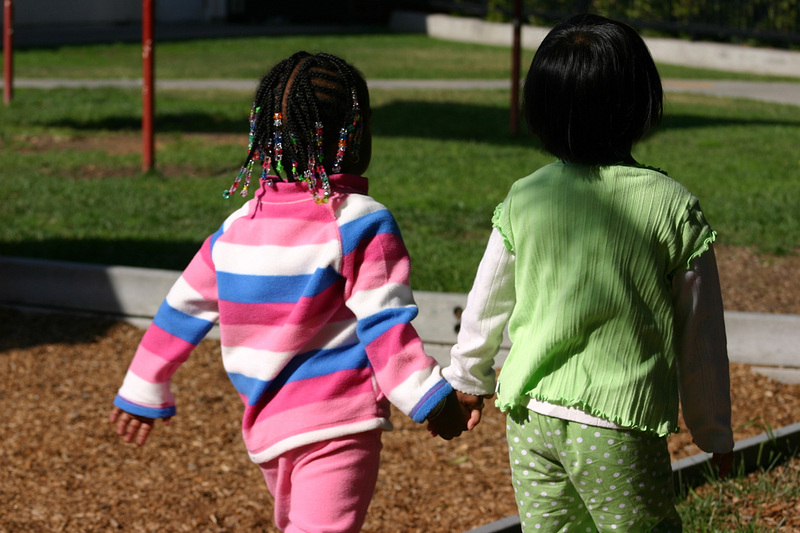 Shouldn’t every neighborhood have good access to high quality Greenways? Because the supply of unused, grade separated rail corridors is limited, one must look for other models for creating new Greenways. Fortunately, another Minnesota innovation provides a promising model for converting streets to Greenways. That innovation is Milwaukee Avenue, located just south of Franklin Avenue and just east of 22nd Avenue in the Seward neighborhood of Minneapolis. In an effort to stabilize a neighborhood facing tough times, a two-block stretch of street flanked by historic railworker homes was converted from a street into a park in the 1970′s. The strategy worked, and Milwaukee Avenue is now one of the most beloved corners of Minneapolis – a symbol of design on a human scale. The diagrams below show how the highly successful Milwaukee Avenue design could be adapted to create Greenways on other residential streets. The Traditional Street in residential neighborhoods of Minneapolis and Saint Paul provides two lanes for traffic, parking lanes on both sides of the street for parallel parking, and alley access to the garage of each home. A grass boulevard separates sidewalks from the street. The main concept for expanding the Greenway system is to convert a traditional street into a linear park, as was done at Milwaukee Avenue. The sidewalks would remain in place, and the space between them would be planted with grass or other landscaping, and a bike path would be built roughly in the center of the park. The path would be engineered to allow access by emergency vehicles. Similar to Milwaukee Avenue, the minor cross-streets would be blocked off, creating space for pocket parks between blocks. At major streets (Broadway, Lake, Lexington, etc) the trail users would cross with a traffic light, bridge or tunnel, depending on the specifics of the situation. Residents of the street would lose the convenience of parking in front of their homes, but would gain the advantages of living directly on a park. 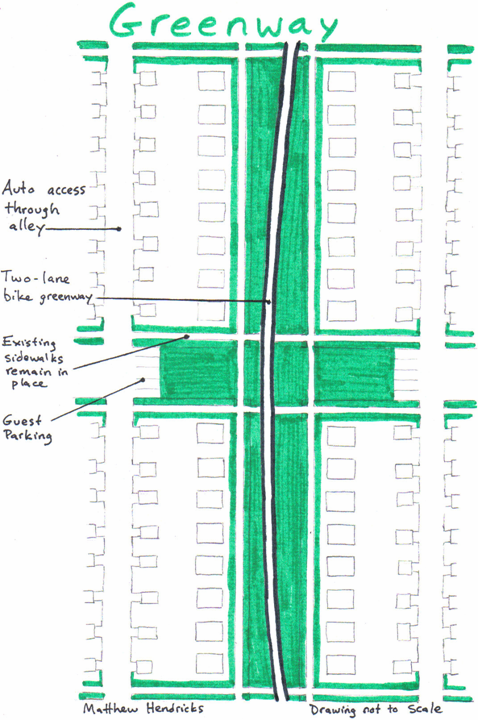 Our Greenway concept is compatible with bicycle boulevards. For example, if a bicycle boulevard included some blocks where the residents wanted to fully convert their streets to parks, then the creation of these Greenway blocks would serve to divert automotive traffic while allowing non-motorized traffic through, thus enhancing the overall bicycle boulevard. If you are interested in getting involved in the community planning process, please let us know on the Feedback page.